Cushion Halo Diamond Engagement Ring with Pave Setting | Shane Co. This shimmering halo engagement ring features 30 round pavé-set diamonds, at approximately .33 carat total weight, that have been hand-selected and matched for exceptional sparkle. 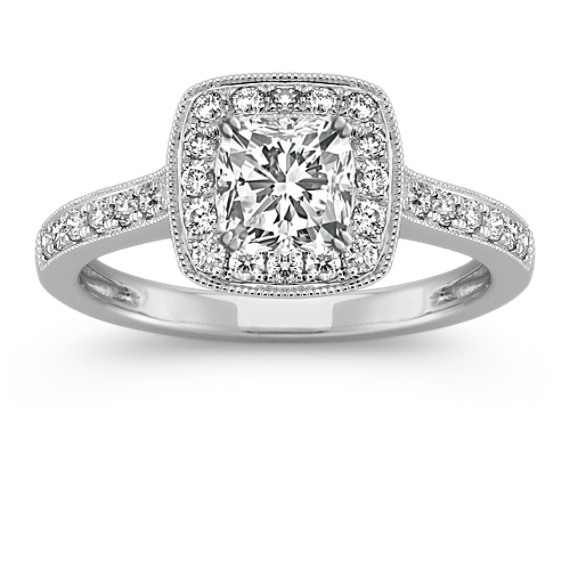 Set in superior quality 14 karat white gold, this ring awaits the center diamond of your choice at approximately .75 carat. I spent many hours looking at rings on Shaneco.com. I've been married 25 years and just wanted a big diamond that sparkled. I couldn't be more please with my ring. The diamond is exquisite and so sparkly I can't believe it's really mine! This is the most beautiful ring! Everything from the diamond to the band is so beautiful. I feel so blessed!